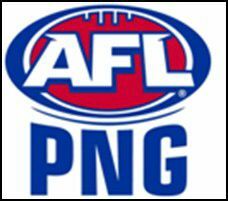 AFL Port Moresby BSP premiership decided for 2012. Around 2000 spectators enjoyed the sun and action at Amini Park in Port Moresby for the 2012 season decider that matched the Moore Printing University Tigers against the Remington Gordon Kokofas. 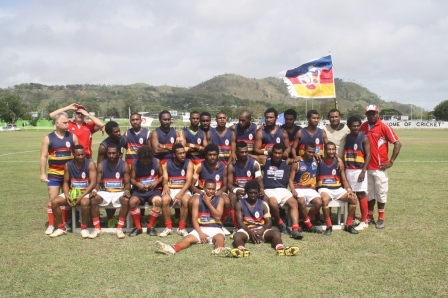 The BSP - Bank South Pacific - season reached a fitting climax with a hard faught Grand Final in warm sunny conditions. The main game was tight all day with no more than a goal in it, until the last 5 minutes when the Tigers broke the game open with a match winning burst of 4 goals. 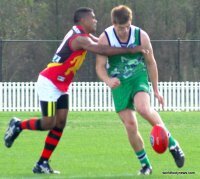 John James from the Tigers was voted best on ground in the grand final. Closely followed by Laurie Logo and Scott Johnson. JJ Peni also had a terrific game in the Grand Final. Best for the Kokofas was Brendan Beno, he had the ball on a string all day and fought very hard for his team kicking 2 of their 3 goals, Paul Philip and Ali Pinda were also excellent contributors for the kokofas. AFLPNG would like to thank Rex and Douglas for their brilliant umpiring display in the grand Final and all volunteers that have helped out during the season. Action from the main game.